my Military Spouse Appreciation Day giveaway! As mentioned in my previous post, I became a Scentsy Independent Consultant so that I can share one of my favorite things with my friends and family: Scentsy wickless candles. As a military spouse, I know that it can be hard to feel at home when the military often requires families to move to new locations every few years. Scentsy helps create a warm, inviting atmosphere that helps make a house feel more like a home. I honestly believe that the sense of smell is the main sense that triggers memories. With over 80 scents to choose from, Scentsy will not only bring back fond memories but help keep memories created in our new homes smelling familiar and comforting. Scentsy wickless candles are a safe alternative to standard wicked candles. They use a highly scented wax that is warmed over a low-watt bulb. Because the wax does not dissipate while it is warmed, the only thing released into the air that you breathe is the fragrance. Full-sized warmers use a 25-watt bulb that melts the wax to the perfect kid and pet-safe temperature. Because the wax is melted at a much lower temperature, spills are quick and easy to clean up in the event that little fingers or paws got over curious. Changing scents is easy too – it can be poured directly back into the container if there is still fragrance left or straight into your lined trash bin. Simply wipe the warmer dish clean with a paper towel and add another piece of wax. In participation of the upcoming Military Spouse Appreciation Day (Friday, May 7th), I am sponsoring a blog giveaway to three fellow military spouses. 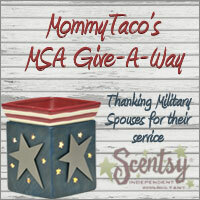 The giveaways will be held on three military spouse blogs, where each will have one winner. I reached out to my Twitter friends and fellow military spouses for anyone who would be interested in hosting a giveaway on their blogs, and have selected three wonderful hostesses. As their part of the event, not only do they host the giveaways and manage entries via their blog, but they also are going to each provide their own individual review of the Scentsy products. Each giveaway winner will receive their choice of a Scentsy warmer and three fragrance bars. If you are interested in participating in this event, or just want to see what they think about Scentsy, please visit one of the three blogs listed below where the contest is being hosted. Entries to the giveaway will be accepted today through Wednesday, May 5th at 11:59 Eastern Time.